In Micro Macro Magazine's design section we discuss all aspects of design. From interior to product, to graphic design. You can find room and office tours, as well as interviews with graphic and product designers. Interior designer Charlotte Féquet fills a Parisian apartment with light. Parisian people (myself included) spend a lot of time out and about in the perpetual bustle of the city, so when they come home for a few hours, they really want to feel at peace in a serene, quiet setting. Designer brief: to create calm in the chaos. 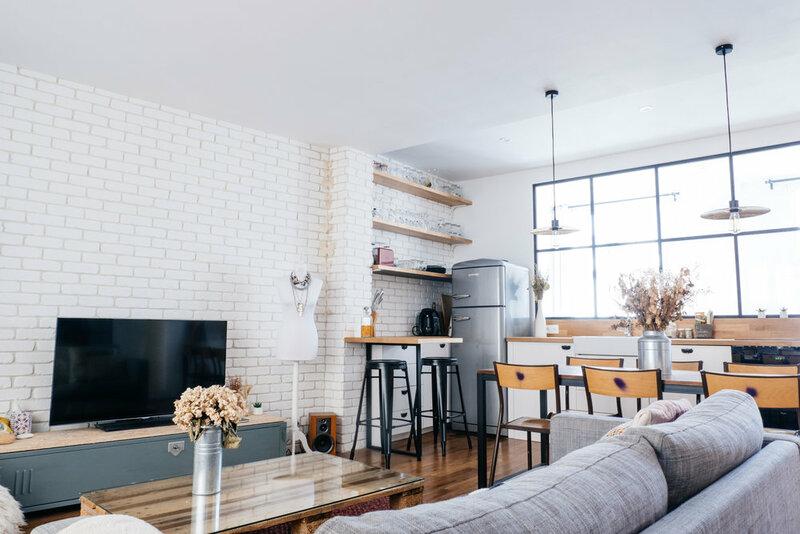 As an interior design fanatic, and after doing a total re-haul on my place in Paris, I wanted to share my secret retreat, my 615 square feet, for you to see. Lucky you ! Moving in to what was a very dark and dated apartment, I entrusted the space into the hands of the wonderful Interior Architect Charlotte Féquet. Well known in Paris for her creative vision, she totally renovated the place top to bottom to create a unique light filled space. Let’s start with the entrance and the living room. I can tell you, we as Parisian people have some high demands, to live in the heart of the city, in a bright apartment, without being disturbed by the noise. But.....it's possible! 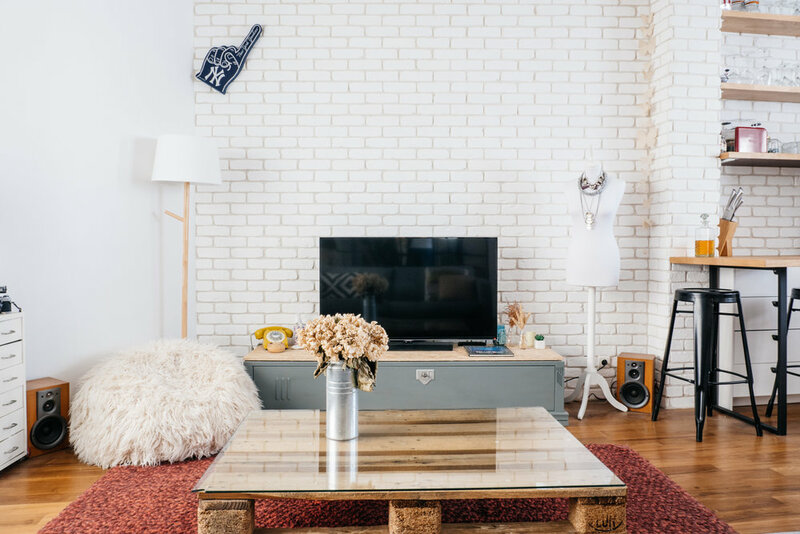 Charlotte decided to fill the living room with light by installing large glass windows, painting walls in a bright white colour, and refining the brick wall with white plaster and sanding the wooden floor. The result was stunning ! The neutral colour palette really brings out the colours of the furnishings similar to a contemporary art space. 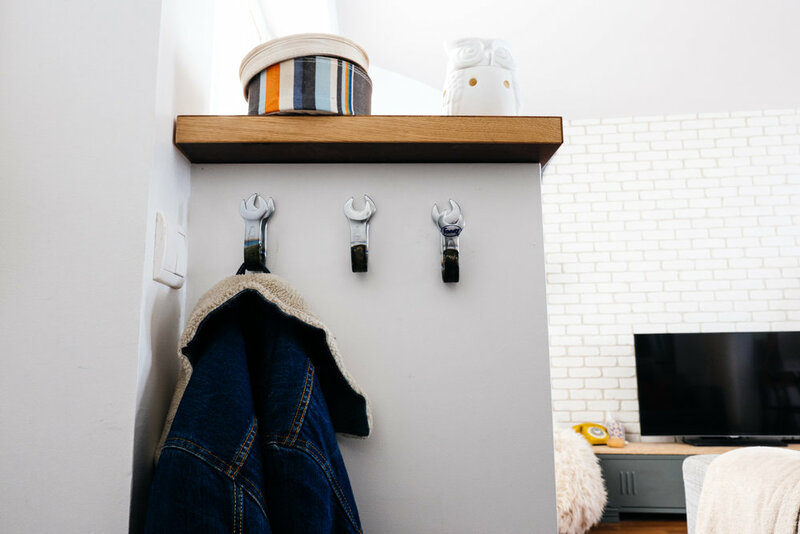 Charlotte created a small wall for the entrance and we decided to add a little DIY touch with 3 monkey wrenches that were twisted and nailed on the wall- a quirky solution to hang up your jacket after a long day! The man of the apartment got creative by building a minimalist coffee table with a large piece of glass, a pallet and 4 small wheels, easy peasy! The two benches (top, right and below, left) are actually lockers that we painted in grey to add a little bit of colour and to match the sofa. It's a useful spot for a television, and it can also be a place to sit and read your favourite book if you pull up some cushions. As we love entertaining friends and family (French people love their gastronomy and sharing it with their loved ones), we wanted to create a guest room in case people wanted to stay a few days, or if they would rather sleep over after a late party, so Charlotte had the amazing idea to create a small bedroom space behind the glass window. The cosy bedroom can be closed by a large white light and sound-minimising curtains, for a sense of privacy. Two wooden shelves and a clothes rack complete the space, with a floor made of rush, very soft for the feet and it warms up the room. We also use this room to play music and for my singing rehearsals. The bathroom needed some refurbishment too; Charlotte switched the bathtub for a shower and replaced the sink cabinet with a modern one. We added a black metal column to keep our towels in order, matching the colour scheme. 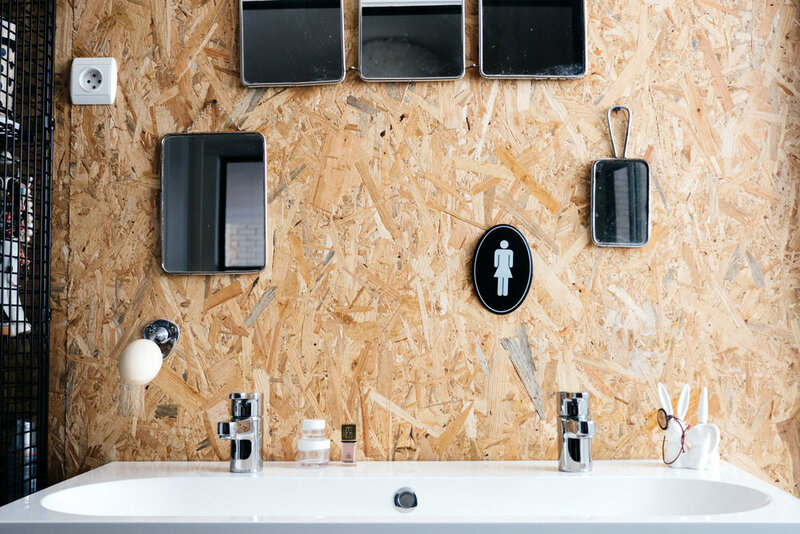 We also installed this huge Oriented Strand Board (flakeboard) especially made for damp rooms, which we adorned with 7 decorative mirrors from a local antique dealer. Last but not least, the bedroom suite. We added light with 2 sound-minimising glass walls. We wanted to keep the bedroom simple so here the creative DIY touch comes through the bedside tables. Made of 3 cinder blocks each, they make a sturdy support for our books and lamps. We also added 4 wooden boxes onto the wall to display our favourite French Literature. Our closet is a large wardrobe with 3 sliding white doors. 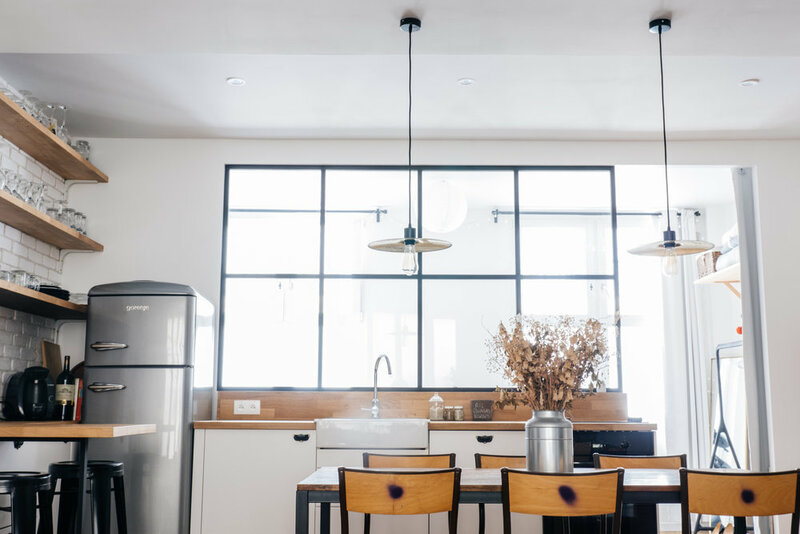 I hope these tips will inspire you to put a Parisienne twist on your own apartment for a sense of renewal. To see more of this place and other inspiring spaces, follow Interior architect Charlotte Féquet and our favourite French photographer Anthony Delanoix on their social media platforms. Readers, what's your favourite way to add light into a cozy space?